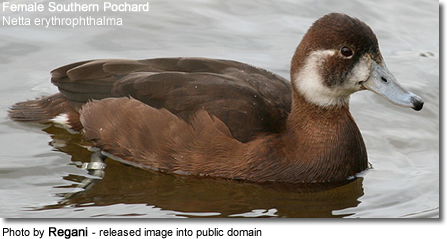 The Southern Pochard (Netta erythrophthalma) is a duck. This bird is sociable and gregarious. It has been seen in groups of up to 5,000. The African (Southern) Pochard N. e. brunnea. The clutch consists of six to fifteen eggs. BirdLife International (2004). Netta erythrophthalma. 2006. IUCN Red List of Threatened Species. IUCN 2006. Retrieved on 12 May 2006. Database entry includes justification for why this species is of least concernMaclean, G.L. Harrison, J.A. Southern Pochard. In: The atlas of southern African birds. Vol. 1: Non-passerines. Pochard usually feed by diving or dabbling - and often at night. They will upend for food as well as the more characteristic diving. Their staple diet consists of aquatic plants with some mollusks, aquatic insects and small fish.